DriveHQ vs Egnyte. What is the best of File Cloud Storages? Store, access and share files online from anywhere at anytime. Includes explorer-like web interface and the state-of-the-art FileManager 4.0. Supports any browsers on PC/Mac. Supports group/sub-group file sharing with read-write access. 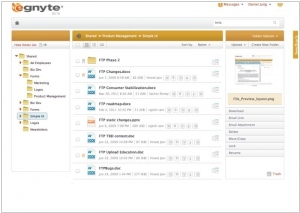 Egnyte Cloud File Server addresses the critical infrastructure needs of businesses - file storage, backup, sharing and collaboration - in one secure, centrally-managed and easy-to-use solution. In combination with its Local Cloud technology, Egnyte enables fast local edit capabilities and offline access to your files. Cloud stoarge company Egnyte announced integration with EMC’s VNX line of on-premises data storage hardware. The deal means that companies that have invested heavily in EMC hardware can use Egnyte on top of their current hardware stack, and get the normal benefits of cloud storage and file management without having to leave their legacy data behind. For EMC, it’s a decent way to extend the value of their physical devices. For Egnyte, it potentially opens up new customers and revenue streams. Egnyte recently announced that it would lean on Google’s cloud to store its raw customer data in the future. So if EMC were worried about cloud storage products eating at its on-premises hardware business, Egnyte could be a pretty reasonable pickup for the legacy firm. It would be interesting to see EMC pick up a company that was a growing Google cloud customer.